One of the men of the season so far, Julian Alaphilippe has come back from a break after winning Milan-Sanremo and is back on top of the podium again at the Tour of the Basque Country. Dan Martin was on the right side of a key split at the end of the second stage at the Tour of the Basque Country today. The stage was won by one of the men of 2019 so far; Julian Alaphilippe (Deceuninck-QuickStep). At the end of 149.5km from Zumarraga to Gorraiz the 26-year-old Frenchman sprinted clear to take his eighth win of the season. On the short sharp climb to the finish line both Bjorn Lambrecht (Lotto Soudal) and race leader Maximilian Schachmann (Bora-Hansgrohe) both attacked. However, despite Schachmann winning the very challenging TT yesterday it was Lambrecht who proved strongest of the pair. And while he put in a very strong bid for victory, once Julian Alaphilippe hit the afterburners nobody could match him. He caught Lambrecht within sight of the line and went past him to win by one second, with Michal Kwiatkowski (Team Sky) in 3rd. Dan Martin was among the fifteen riders who managed to keep Julian Alaphilippe at just one second on the finish line. After the stage winner today, a total of 15 riders finished on the same time a single second behind the victor on the day. 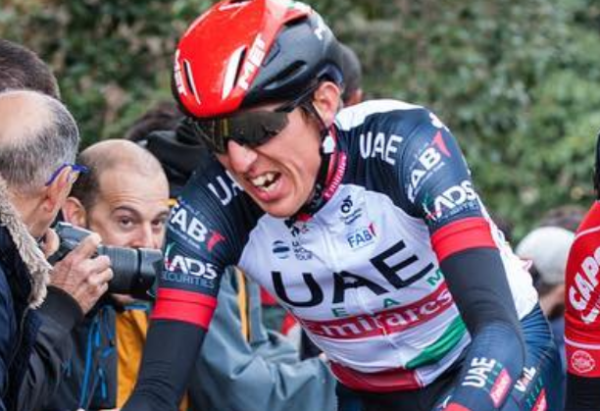 And Dan Martin (UAE Team Emirates) was just at the back of that group, keeping his general classification hopes intact. The yellow jersey was also in that group and he remains at the top of the general standings. He leads by 10 seconds from Kwiatkowski, with Julian Alaphilippe 3rd overall a further second back. Nicolas Roche (Team Sunweb) placed 85th today in a group 8:15 down. He was 72nd in the hilly TT on Monday, at 1:26. The Irish rider is working this week for Sam Oomen and is also road captain; appointed to guide the young emerging riders in the team. Dan Martin finished 14th in the opening TT yesterday, some 35 seconds down on the flying Schachmann. And having made the key split today while those behind lost time, Martin is now 9th overall at 39 seconds. Interesting, his young team mate and last year’s Tour de l’Avenir winner Tadej Pogačar was 8th on the stage today having finished 18th yesterday; eight seconds down on Martin and 43 down on Schachmann. Pogačar has already won a stage at the overall at Volta ao Algarve em Bicicleta (2.HC) and it should be interesting to see how the 20-year-old and Martin get on in the same line-up this week. There remains four stages, featuring plenty of climbing and a 1.4km kick upwards at the finish tomorrow.